Owning a car is a never-ending journey of maintenance, repairs, and expenses. Fortunately, there are ways to lessen expenses by taking on project yourself. If you are not comfortable taking on the responsibility of car mechanics on your own, then it is always in your best interest to find a trusted mechanic who can help guide you through any repairs or maintenance services in an efficient, skilled, and professional manner that won’t drain your bank account. While it may not be the cheapest way to perform maintenance, it sure beats incorrectly performing maintenance on your own; this can lead to more costly repairs down the road that you never anticipated. One of the most important parts of car maintenance involves preventive tasks that you can check yourself in the comfort of your own driveway. Checking your car’s fluids is one of the most important preventive maintenance tasks that one can perform, because it can tell you a lot about what is happening in your car’s engine. If you notice that any of your fluids are low, or look dirty, you should bring it into a professional mechanic for inspection. While all your car’s fluid levels are important, one fluid in particular may not be familiar to you; transmission fluid is one of the lesser known about fluids that your car needs in order to run properly. If you know quite a bit about cars and feel comfortable changing the transmission fluid yourself, here is an easy step-by-step way to begin that process. It’s going to be messy, and there are materials you will need to be best prepared for the job. Keep plenty of old towels on hand, tarps, newspapers, and oil or transmission pans to catch any of the leaky fluids. First, let your car run for a few moments to get the engine to warm up a little—do not go for a drive, as this will make the engine too hot to touch or work with. Turn off the car, and safely raise the car using ramps in the front, block barriers in the back, engaging the safety brake, and turning the car ignition off. Remove the bolts on the transmission pan carefully; liquid will spill out if the pan tilts at all. Be ready with another oil or transmission pan to catch all of the old fluid. Take off the gasket seal by loosening screws that attach it to the drain. 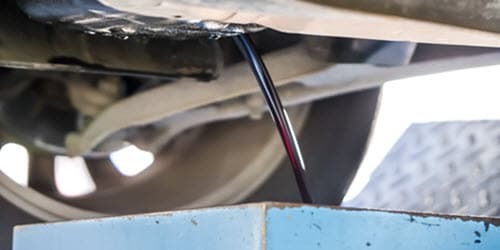 Look carefully in the used transmission fluid to inspect it for debris; sometimes when another issue is going on with the vehicle you may find tiny microscopic metal shavings that look like dirt or dust, and collectively make the fuel look cloudy or muddled. It is important that if you do find any metal shavings, you should bring your car to a professional car service center for an inspection to be sure that there is nothing more serious in need of repair. After you dump the fluid into the extra oil pan, you must clean the transmission pan with a solvent-based product so that there are no remnants of the old fluid in there—it will contaminate the new fluid with metal shavings, debris, or even the old fluid itself. Next, take off the filter and O-ring, which will both have fluid still left on them, so you should be sure to be prepared with a towel or a tarp to put beneath it as you take the parts off. Be ready with a new filter for your transmission, and affix the O-ring back into place. Then, you will put a new gasket on the new transmission pan. Screw and bolt everything back in tightly, and clean it all up with a rag. Once everything is tightly back into place, you can take the car off of the lifting device or ramps, and pop the hood. Fill up the transmission fluid to the correct amount, and then start the car to get it nice and toasty. Then, turn off the ignition and inspect the bottom area of your car for any leaky spots. If there is a leak, likely something isn’t sealed properly or tightened enough. If it all looks good, drive your car around the block getting the fluids to circulate and heat.